Quickturn offers mini CD and mini DVD duplication and printing, business card and hockey rink size CD duplication and printing. We are confident our mini DVD & CD prices are among the lowest in the Midwest and the surrounding area. Price per CD / DVD decreases with larger quantities. Click here for same day, 24 & 48 hour rush jobs. All prices include the CD or DVD. No Hidden Costs. 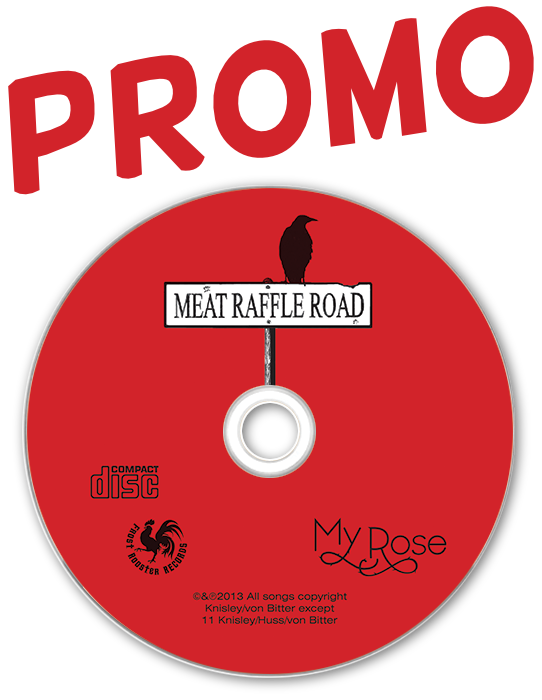 Mini CD and DVDs will be duplicated and Inkjet print for smaller quantities. Disc Replication and Screen-printing will be used for larger quantity mini CD and DVD orders. 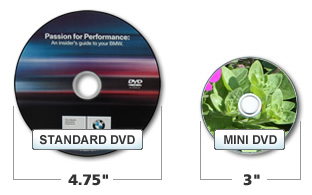 A 3 inch Mini CD & DVD is the standard size of a mini disc. It is ideal for mass mailing or as magazine insert. With 1.4GB, mini disc DVD can hold about 30-minutes of quality video. 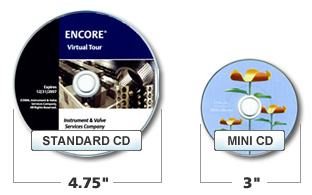 The standard Mini CD holds 18 minutes, or 155 MB. A great promotional item for marketing and instructional video. 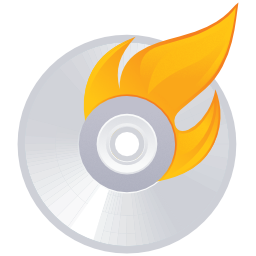 Mini DVD/CD is compatible with most all the players on the market, if it can fit into the smaller inner tray of any regular DVD/CD player. Note: Mini CDs / DVDs CANNOT be used in most slit-loading devices such as car stereo and some iMacs. But on most tray-loading DVD devices there are two "wells"; one sized for a normal DVD, and a smaller, deeper well for Mini DVD's.